The popular Playbook series from Candle has gone from strength to strength. With peek-through windows and fun shapes this chunky board book will provide hours of playtime fun for ages 1-4! 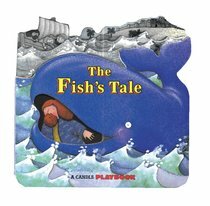 About "The Fish's (Candle Playbook Series)"
This text teaches children to trust in God, while the peek-through windows and fun shapes in these chunky books provide playtime fun. This delightful interactive board book takes preschoolers back to Noah's Ark, where they can peer through "peepholes" to follow Noah, his family, and their animal friends as the floodwaters rise! This delightful interactive board book takes preschoolers back to the very first Christmas, where they can peer through "peepholes" to follow Mary, Joseph, and their donkey on their journey to the stable in Bethlehem.